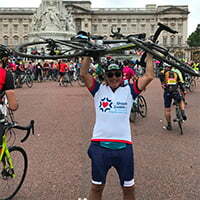 Staff and partners at London accountancy firm, Grunberg & Co, have congratulated their colleague Alain Stechler on completing the gruelling Prudential Ride 100 in aid of Shaare Zedek Hospital. Alain was among 30,000 riders who took part in this year’s event, which was beset the whole day with extremely wet and windy weather. The route, which started at the Olympic Park, Stratford, saw participants ride through the capital and into the surrounding Surrey countryside before heading back to The Mall, was completed by Alain in just over six-and-a-half hours. However, he has said he is most proud of raising almost £7,000 (his initial target being £5,000) for the hospital in Jerusalem, which is world renowned for its paediatric, heart, emergency and research departments and for its relief efforts worldwide. Speaking about his participation in this year’s event and his reasons for choosing his cause, Alain said: “Shaare Zedek Hospital stands as a beacon of peace and harmony in a troubled region. The hospital has been for many years and continues to be a giant in the world of medical research and disaster recovery, helping so many people in so many countries worldwide and I can think of no better cause to support. Alain, a Partner at Grunberg & Co, is no stranger to long distance cycling, having previously completed events around the world to raise money for various charities.